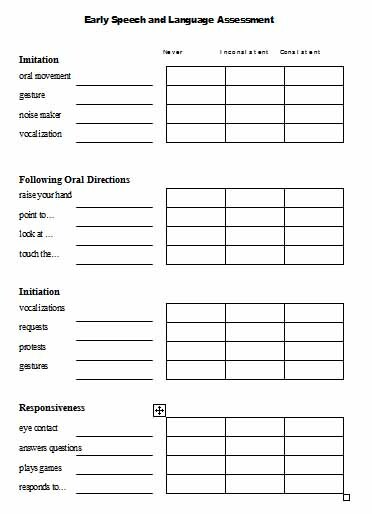 Language Screening Tools | Free Language Stuff! 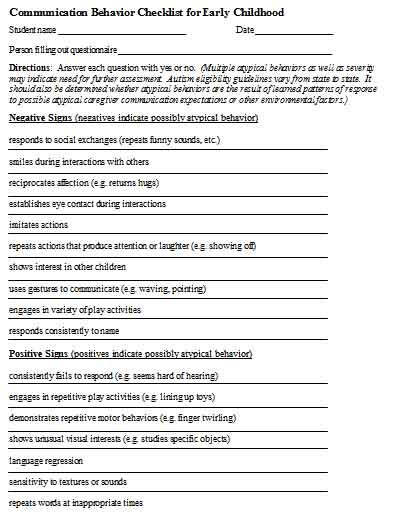 This entry was posted in caregiver involvement and tagged autism, behavior, checklist, language screening, screen on Monday by Paul. Wow! These are great! Thanks again for sharing! You are making my job a lot easier! Thank you so much for your comments. I greatly appreciate any feedback…especially positive feedback 🙂 Seriously, I’m excited that others are benefiting from this material, and look forward to sharing more and reading more comments. As long as you keep sharing I will keep commenting. I actually shared this website address with a study group that I run for our district so hopefully they will be getting on here soon and leaving some comments as well. Thanks again for all you are doing to help other SLPs! Great and useful to gauge my students’ level of english. And many many thanks again for sharing them. Thanks so much for posting all of your worksheets online. They are terrific!! Do you have some tools for adult rehab? Thank you so much for your language screening. I have been looking everywhere for something like this! Hi! These are great! Do you perhaps have a reference for them? I’d like to use them in a study I’m doing. Exactly what I was looking for this morning..THANKS! Is there a reference for the Language Milestones – Normal Language Development?? I love it, but would also love to know the references! Thanks! This was exactly what I needed! 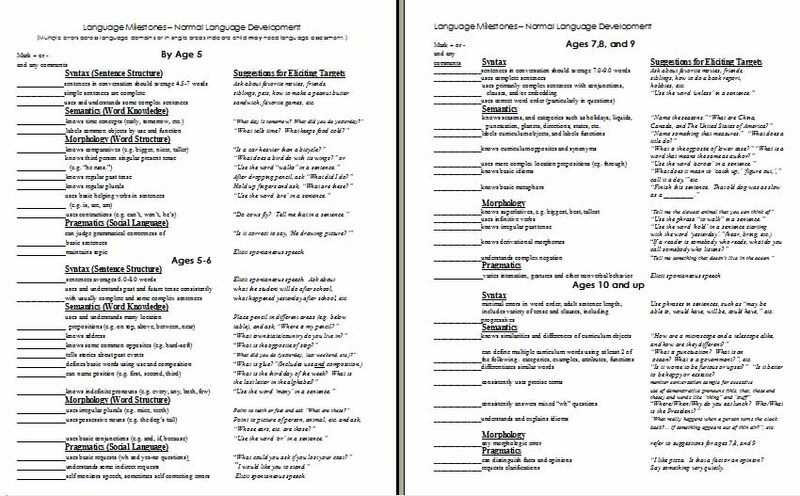 I would like to know if there are references for the Language Milestones – Normal Language Development. My director is asking for them. Thank you. No, the lists are meant to be suggestions only. The words are flexible and can and do change from kid to kid. Thank you! I’m a CF and feeling overwhelmed with what I see, the needs, making therapy functional, feeling like a make a difference in thirty minutes and the list goes on…. This is really helpful. Glad to help – It’s definitely overwhelming at first, but the possibilities for reward are truly countless once you get comfortable. Good luck! thank you so much – I’ve been looking for a screener to use for my kids brought up by I&RS in my K-5 school. thank you!